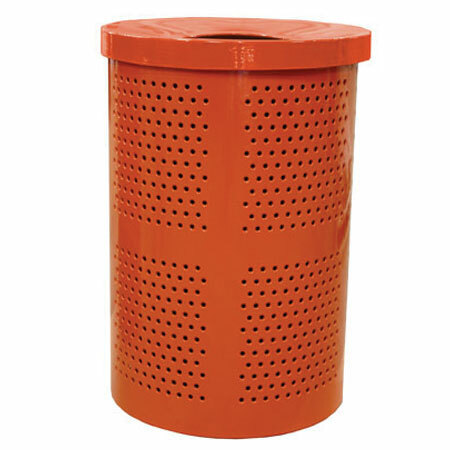 <?xml:namespace prefix = "o" /> Commercial waste receptacles are available in many different sizes, designs, and colors. Visitors can easily see where they can throw away their trash to avoid waste from taking away nature’s natural beauty. Customization is easy with models that include a logo to advertise your company. Commercial trash cans have various lids and finishes to choose from so you’re guaranteed to find what you’re looking for. 32 gallon trash cans are available that are made with heavy duty welded steel, which is perfect for holding up in the harsh weather conditions. Many different colors are offered from a thermoplastic finish. Pre-drilled mounting holes make them easy to install in convenient locations. For businesses that want an easy way to advertise, consider having your custom logo or selected words cut into the steel of the trash can. Red trash cans can often be found outdoors so groups that walk by can easily spot where they can throw away their trash. However, with the many different color choices available, you can easily have the metal garbage can stand out or blend in with its natural surroundings. 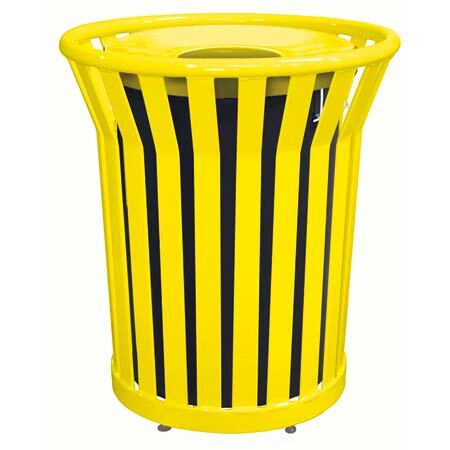 Garbage cans for schools, theme parks, or stadiums can display the shade that matches their team’s colors. Trash can lids can be important elements for the outdoors. Protective, spun metal and ash bonnet lids are offered with multiple garbage can models. Where you plan to place the commercial outdoor waste receptacle can help determine what type of lid will work best. You can easily have the same receptacle design with different lids throughout the property to not only make it convenient for people to discard their cigarettes, but lids can also make it easier for others to throw away their trash. Expanded receptacles are constructed with heavy duty metal and a weather-resistant thermoplastic finish. 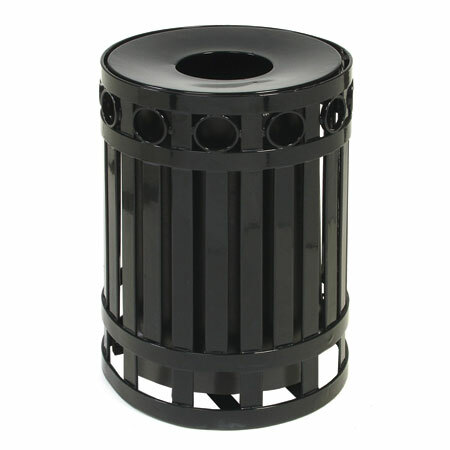 Like other metal garbage cans, this type comes in many different colors that range from red to beige to black. Without a doubt, you will find a color that works perfectly for your outdoors. Expanded outdoor garbage cans are able to be spotted by customers and can easily be mounted in various locations to keep trash from building up on streets, sidewalks, and parks. 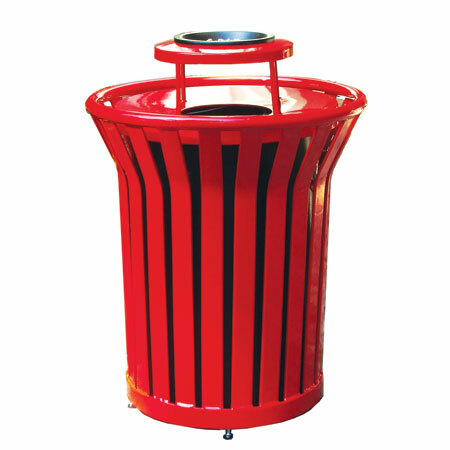 Decorative garbage cans are durable and made to withstand heavy traffic areas and harsh weather conditions. Heavy duty welded steel with a colored thermoplastic finish is weather-resistant and provides a stylish look that won’t take away from Mother Nature’s splendor. The ring designer receptacle will hide the trash that has been thrown away to avoid an unappealing look. Outdoor commercial waste receptacles have been made to not only create a designated area for your guests to throw away their trash, but for you to have a long-lasting garbage can that doesn’t require frequent maintenance that takes away time and money. 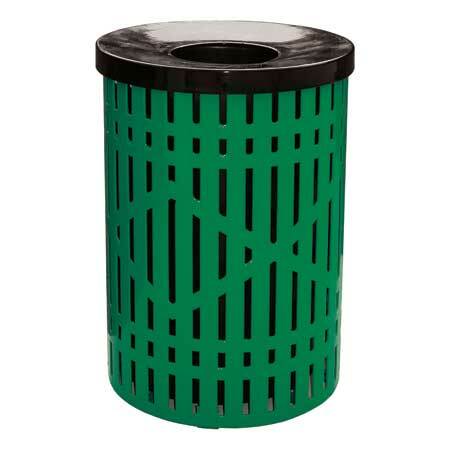 The heavy duty metal garbage cans are available in different designs so you can customize the look of your school, business, theme park, or stadium. You will several options regarding outdoor commercial trash cans, including what type of lid you want the trash can to have, whether you want to hide the trash from plain sight or not, as well as what color the trash can is painted. The standard online source contains a wide selection of commercial steel park outdoor trash cans. Basic models are priced toward the low end, with larger, more durable designs representing costs reflective of a long term investment in heavy traffic environments. 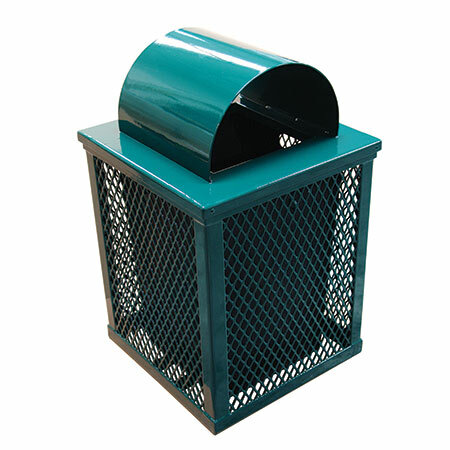 XPB Locker Supply offers a complete selection of commercial steel park outdoor trash cans. Basic models are priced toward the low end, with larger, more durable designs representing costs reflective of a long-term investment in heavy traffic environments. Decorative trash cans are the best tools for managing waste before it becomes an eyesore and a possible health hazard. Because they stand out with color, they are immediately visible to people. Outdoor trash receptacles ensure that building waste management remains convenient, efficient, cost effective, and environmentally friendly. Contractors can contact XPB Locker Supply to purchase trash containers at discount prices. Large commercial waste receptacles are ideal for indoor and outdoor areas where large crowds gather. A 32 gallon welded wire receptacle is a reliable and economical trash container designed for permanent installation in areas where guests frequent. Outdoor metal trash cans are extremely important. They hold all of that trash that we have to throw away at sporting and entertainment events, parks, and other locations necessary. Without outdoor trashcans, where would all of our trash go? What about indoor metal trashcans? Parks, sports arenas, and other places that attract a large population most likely use trash cans or some type of trash receptacle. We offer commercial discount pricing. 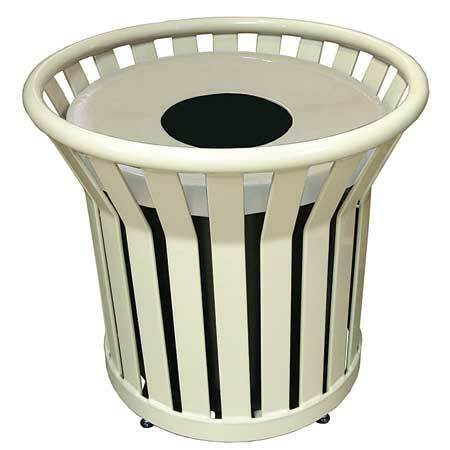 You can compliment your outdoor areas, parks and picnic areas with modern, jazzy outdoor waste and trash receptacles. Come see our large selection at factory direct prices.